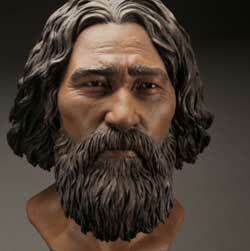 A re-elected Harper government would crack down on dual citizens originally from Beringia, sources are saying. The sources say Harper and his advisors consider many Beringians to be a threat to Canada or at least to Harper’s vision of Canada. According to Statistics Canada there were at least 1,400,685 residents of Beringian origin in Canada at the time of the 2011 census. Almost all those of Beriginan origin were born in Canada and are Canadian citizens by birth. Beringians are among the fastest growing demographic group in the country. A reconstruction said to represent the notorious human smuggler known as “Kennewick.” If spotted call 911 or Crimestoppers. The source said the Harper government has ordered both the RCMP and CSIS to search for two alleged kingpins of the human smuggling operation known by the names “Clovis” and “Kennewick.” Investigations have indicated that one of the human smuggling rings may be headquartered in the Folsom, California area. Another smuggling route is along the rugged coast of British Columbia where the many fjords and islands are a perfect landing spot for “boat people from Beringia seeking a better economy,” according to a Conservative Party source. Bluefish Cave in the Yukon is known to be a hiding place for the illegal migrants for Beringia, the source says. The sources say that anyone of Beringian origin convicted of a terrorist or any other anti-government activity would, after serving time in prison, would be stripped of their citizenship and deported back to Beringia. 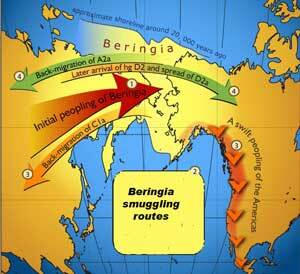 Map showing the human migration, some say smuggling, routes between Beringia and Canada. Posted in politics, satire and tagged with Canada, police, politics, satire. RSS 2.0 feed.